Hello from down under! 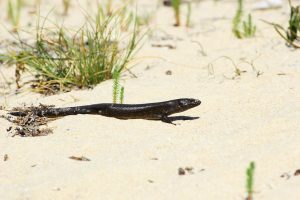 Can you tell me if your lizard repellent will keep the king’s skinks out of my yard? They’re scaring my kids who use it as excuse to stay inside the home to play video games. And can you send me some? The King’s skink might be large but like our Iguana, they won’t like PEST RID. You can use just the spray which will last 30 days a treatment but if you put the granules down first and saturate them with the spray, you’ll get 60-90 days of protection per treatment. 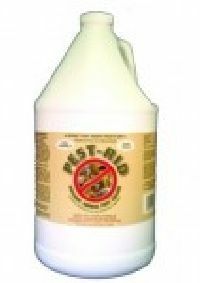 Created to use on various amphibians and reptiles, PEST RID GRANULES will cover 250 sq/ft per lb so our 2 lb jar is enough to treat 500 sq/ft. It uses food grade essential oils so it won’t hurt animals, plants or people but it will repel nuisance animals. First, sprinkle this out along property borders where they enter. One jug will treat up to 500 linear feet. But if they’re under a deck or shed, treat the entire space. Its important to understand the granules by themselves will not don any repelling as they need to sprayed with the LIQUID PEST RID so they absorb the oils, scent, etc. So once the granules are in place, spray over the top along with any other surfaces you might want to protect like the side of the home, deck railings or outside furniture. 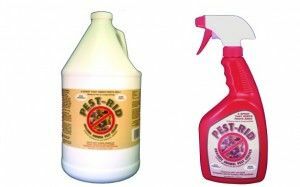 Pest Rid will effectively repel snakes, frogs, toads, and more. The quart sized sprayer, pictured to the right below comes with its own sprayer on top and will cover up to 125 sq/ft. The gallon is just a jug so you’ll need a sprayer to apply it; you’ll get 500 sq/ft of coverage per gallon. To have these shipped to any country other than the United States, you’ll need to use the links above which go to our international shopping cart. In that cart you’ll be able to see shipping options and costs before making payment.